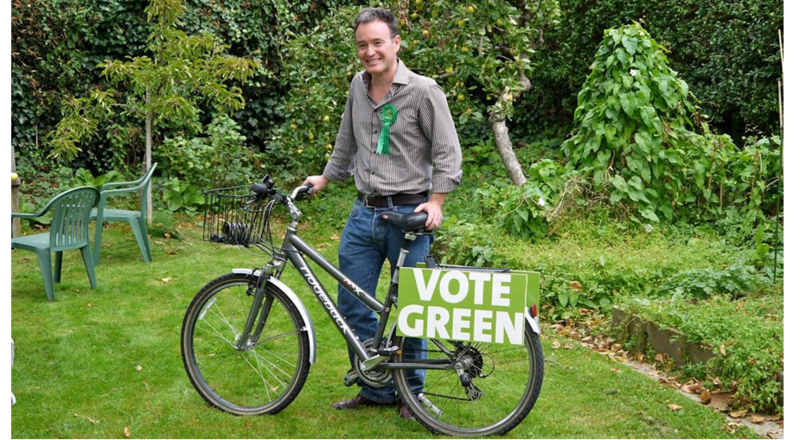 Alexis Rowell for a Greener Camden: Reflecting on my political journey - or rather on that of Labour and the Lib Dems! Reflecting on my political journey - or rather on that of Labour and the Lib Dems! I've just been reading today's Camden New Journal and Ham&High. As expected, my selection as the Green Party candidate for Highgate has sent a few ripples through Camden politics. Both papers pick up on my political journey - from Labour to the Lib Dems to the Greens - so I thought I might dissect that a bit. My politics and principles haven't actually changed much during my adult life. Of course, climate change and peak oil have shot to the top of my list of concerns, but most of my other views remain intact from my student days. What's happened is that the political parties I've been part of have traded their principles for power. I joined the Labour Party many moons ago when it believed in social justice rather than financial aspiration and Rupert Murdoch. I was even a branch chair for a couple of years - although only in Paris so not exactly a hotbed of Labour activism! I eventually left over Tony Blair's illegal and shameful war in Iraq. I also felt that New Labour had moved much too far to the right. I spent a year out of party politics and then joined the Lib Dems because I liked their environmental policies and because it seemed to me that they had a a good chance of taking control of Camden Council. In the end it was thanks to the three seats we won in Belsize, which nobody expected us to win, that the Lib Dems became the largest party in the council and I became Camden Eco Champion. I left both the Labour Party and the Lib Dems on issues of principle. I don't have a problem with taking difficult decisions; I'm just not very good at supporting bad decisions. Going to war in Iraq was a bad decision, as most Labour supporters will agree. 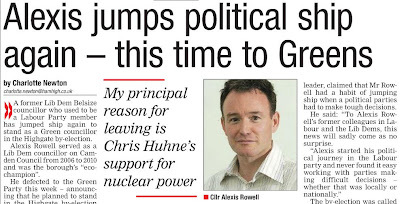 Building a new round of nuclear power stations is a bad idea, as most Lib Dems will agree. The one big change in my thinking during my adult life has been about economics. I was trained as a conventional economist at University College London, but these days I no longer believe in growth (or voodoo) economics, a debt-based (or enslavement) financial system and shareholder (or casino) capitalism. They don't work and they do too much damage - to people and to the planet. The sort of get-rich-quick, growth-at-any-cost, me-me-me capitalism that Margaret Thatcher and Tony Blair promoted isn't fair, isn't sustainable and isn't making us happy. It's part and parcel of a society where bankers feel it's ok to pay themselves exorbitant bonuses, where politicians fiddle their expenses, where tabloid journalists hack phones and where police officers accept bribes. The Green Party seems to me to be the only political party that understands that this is all joined up, that we have to change the fundamentals of our society and our economy, and that principles are actually important in politics. 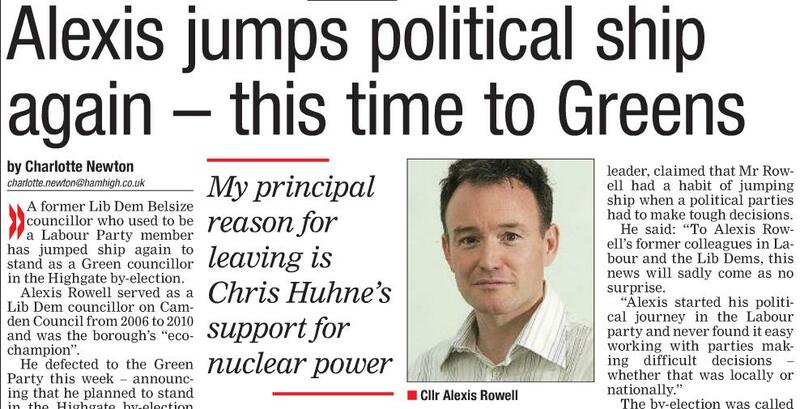 That's why I'm now in the Green Party and that's why I've now thrown my hat back into the political ring.